Situated in the picturesque Sierra Nevada Mountains, Lake Tahoe is a popular year-round vacation destination with plenty of lodging options. Winter brings skiers and other adventure enthusiasts in droves, while the summer months are ideal for lounging by the shore, cruising on the lake, or doing a little waterskiing or kiteboarding. With a portion of the lake in California and the remainder in Nevada, you can have a completely different vacation experience, depending on where you stay. The main areas within Lake Tahoe are South Lake Tahoe, CA; Tahoe City, CA; Incline Village, NV; and Stateline, NV. A variety of lodging options are available along the shoreline -- everything from cabins, private homes, hotels, and even campsites. The following options are all available year-round. Located on the south shore of Lake Tahoe, the Deerfield Lodge at Heavenly is in the heart of Ski Run Boulevard between the ski base and Lake Tahoe itself. Ski Run is one of the draws in the South Lake Tahoe area. It's less than a mile long, but features the Ski Run Marina at one end and chairlifts to the Heavenly Mountain Resort at the other. In between you'll find some great restaurants as well. Deerfield Lodge is the #1 rated hotel in South Lake Tahoe on TripAdvisor. The boutique property features a variety of rooms and suites, some with Jacuzzi tubs. There are fireplaces, fridges, microwaves, in-room coffee makers, Wi-Fi, cable, and more. It's one of the most beloved properties in the region -- it's been part of the landscape for over 50 years, but saw a lot of destruction during a fire in 2014. The property was closed for 18 months and was rebuilt during that time and is open for business again. Rates: Rates are very reasonable with rooms starting at about $130 in the fall and $165 in the winter. Be advised it can fill up quickly so be sure to book peak holiday periods like Christmas far in advance. Lake Tahoe Accommodations offers a variety of luxury rental homes in Lake Tahoe. 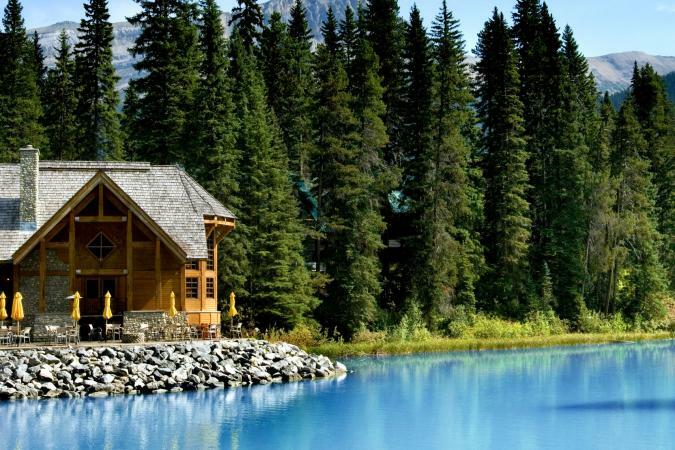 They are a full-service vacation rental management company with a variety of rental homes, cabins, and condos. The family-owned business has four offices in the key areas of Lake Tahoe. Booking with a rental management company like Lake Tahoe Accommodations is ideal because they manage a wide variety of homes, giving you ample choices based on your priorities. Search by number of bedrooms, property type (house or condo), and specific area on the lake. You can also dial down your preferences to features like a hot tub, pet-friendliness, proximity to the ski resorts, waterfront location, or lake view. Guest testimonials are generally positive, citing the ease of booking, included amenities, and clean accommodations. Rates: An example of a Lake Tahoe property available is a spacious 4 bedroom, 3 bath luxury cabin with game room and hot tub from around $680 per night. With the ability to sleep up to 10 people, this is a very affordable option in South Lake Tahoe. With over 150 rental properties, Tahoe Luxury Properties can book you into a huge lakefront estate or a more charming ski cabin. 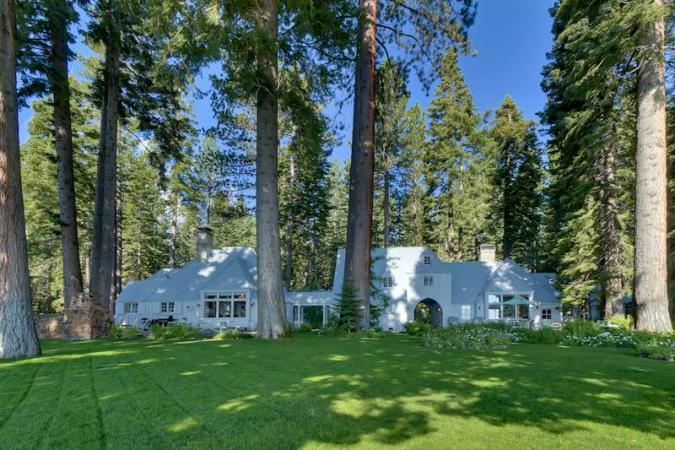 They specialize in real estate sales as well in some of Tahoe's most popular areas like North Shore, East Shore (NV), Incline Village, Crystal Bay, Truckee, and Squaw Valley. Tahoe Luxury Properties is very attentive to both homeowner and traveler needs. The company was started over 20 years ago by a local who was frustrated by his own property management company. He's built up a successful business and represents a portfolio of multi-million dollar estates in the area. Reviews are very good on Yelp with an average 4.5 star rating. Rates: Posh options include Carousel Estate - Lakefront. It has 11 bedrooms, six bathrooms, two large living rooms, a dining room with 16 chairs, outdoor fireplace, hot tub, wood-burning fireplaces, and more. It sleeps up to 22 guests and ranges from about $1,400 to $6,000 a night. Part of the Diamond Resorts, Lake Tahoe Vacation Resort is located in South Lake Tahoe -- one of the best spots to visit year-round as the scenery always changes, along with the activities available. It's adjacent to Ski Run Marina and Heavenly Mountain Resort Base Lodge, ideal for winter snow sport enthusiasts. It's also only a mile away from the casino district if you want to do a little gambling. Activities in the area include hiking, mountain biking, wakeboarding, golf, water skiing, and snow skiing. Enjoy the summer blooms and the autumn leaves. Winter is stunning in South Lake Tahoe as the snow settles in around the mountains. Reviewers on TripAdvisor like the convenience of being able to walk nearly everywhere, how the rooms are appointed, and the accessibility to the lake itself. One noted downside is some of the rooms, especially the studios, may be on the smaller side. Rates: A typical night's stay in one of the studio units can start at under $100, while larger one and two-bedroom units are usually in the $150 to $250 range per night. With 437 luxuriously appointed rooms, the MontBleu Resort Casino and Spa is one of the best resorts on the Nevada side of the lake. Recommended by USA Today's 10 Best as the number one casino resort in Lake Tahoe, rooms feature lake and mountain views, living area, big screen TVs, dining area, and wet bars. There is Wi-Fi access, but there is a fee. The onsite restaurant, Ciera, is well-known in the area, and features a great menu of steaks, chops, fresh seafood, and vegetarian options. They have a 300-plus bottle cellar of wines and champagne. If you're hoping for a Vegas style "all-you-can-eat" buffet, you'll find that here as well. When it comes to playing games, look for various table games, slots, tournaments, and special clubs. The casino has won awards, including a spot on 2015 list of best casino gaming in Lake Tahoe. If you prefer a more relaxing time, head to the full-service spa and book a treatment, chill in the private relaxation rooms, or work out in the fitness center. Rates: Expect lake view rooms, with your choice of one king or two queen beds, to go for about $300 a night during the winter season. Be sure to check MontBleu Resort Casino and Spa's website for current and ongoing promotions. If price is your number one concern, you may consider hotels like the Budget Inn South Lake Tahoe. The property is close to the Nevada Stateline and casinos like Horizon, Caesars, Harrah's, and more. Despite being a budget property, they still offer a number of amenities, like a heated pool, Wi-Fi, guest laundry, cable TV, fridge and microwave, wake-up service and more. The Budget Inn South Lake Tahoe has a good 6.2 rating on Hipmunk Hotels and features simple rooms with either queen, king, double, or even three or four beds if needed for a family. Most reviewers love the location and service, with the food earning the lowest marks. Rates: Targeting the more budget-conscious traveler, the Budget Inn has rooms starting as low as $35 a night. If you're in search of the Vegas-style casino feel, consider booking Harrah's Lake Tahoe Hotel and Casino. 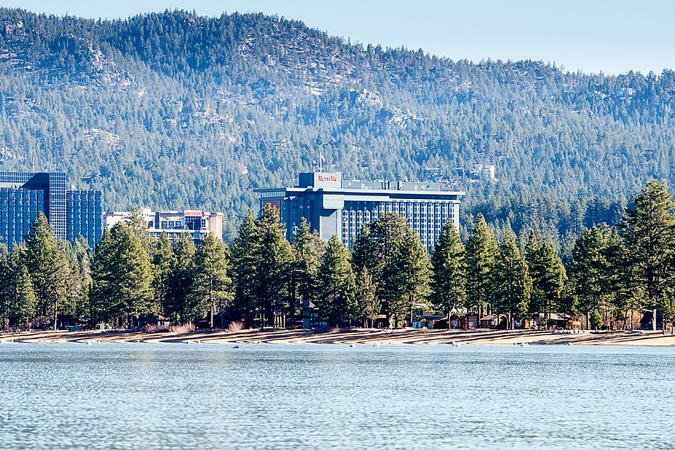 It's recognized as one of the top Lake Tahoe casino hotels by Five Star Alliance. The hotel has 18 stories and 525 rooms, all of which are 500 square feet or bigger and include two complete bathrooms and a king or two double beds. Guests primarily rate Harrah's Lake Tahoe at a 4 or 5 star experience. Especially popular with couples, it's also been featured as one of the best mancation hotels in the area. Like its Las Vegas counterpart, Harrah's is synonymous with fun. You'll find a variety of nighttime entertainment options, like live shows and well-known bands playing in the bars and clubs. When it comes to food, there is no shortage of options. From a casual buffet to more high-end fine dining, you'll have an endless choice of where you want to eat. Don't miss making a reservation at Friday's Station Steak and Seafood Grill -- it's located on the top floor and features magnificent views from every table, along with a 1,000 bottle display wine cellar. Rates: Check the website for current room specials. Rooms start at about $100 a night. If the ultimate spa experience is what you are after, book a night or two at The Ritz-Carlton, Lake Tahoe. The 17,000 square foot spa and fitness center is themed around water and the forest surrounding the property. They even have a line of seasonal spa treatments like Coffee Cake Break, Pumpkin Facial, and a Winter Signature Apres Ski Massage. After your treatment, relax by the fireplace in your restoration lounge, hop into the dry-heat lodge to detoxify, or get rejuvenated in the eucalyptus steam room. While the spa is a sight to behold, the rooms are breathtaking. They feature floor-to-ceiling windows, in-room gas fireplaces, and more. Plush linens, Asprey bath amenities, and lighted make-up mirrors are just a few of the touches you'll find in your guest room or suite. 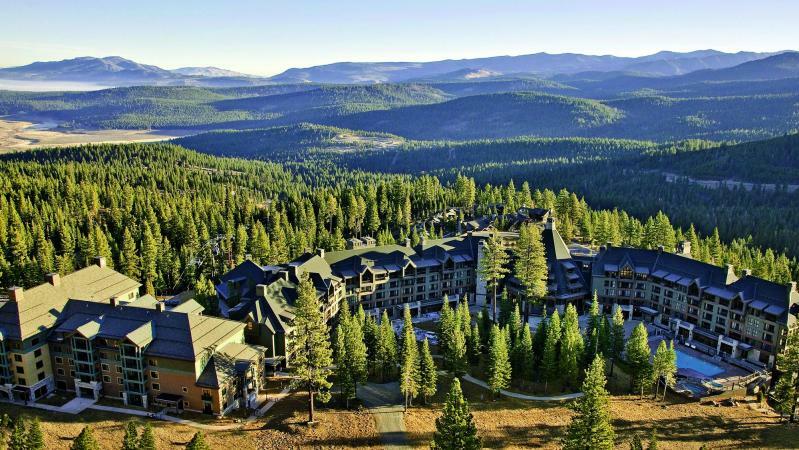 The Ritz-Carlton, Lake Tahoe is the only AAA Five Diamond mountain resort in California. When it comes to dining at The Ritz-Carlton, don't miss Manzanita, where you'll find "blues, brews, and BBQ." For a more casual experience, enjoy the outdoor Backyard Bar and BBQ. The Living Room is a casual spot around a beautiful stone fireplace where you can settle in with a cocktail after a busy day on the lake or the slopes. For some of the best views, grab a drink at the Highlands Bar, which offers stunning views of the Sierra Nevada Mountains. Rates: Rates can start as low as about $265 during off season. The one downside to this hotel over some other properties is the high daily resort fee of $30. They also charge a $39 nightly valet parking fee (no self-parking available). While South Lake Tahoe is one of the more popular areas to stay, you're guaranteed an amazing time no matter what side of the lake you book. It's important to figure out what activities are your biggest priority when you're visiting and concentrate your search in that area. No matter whether you book a casino hotel, luxury cabin, budget hotel, or splurge for a luxury lakefront estate, Lake Tahoe offers something for everyone -- even if you want to do nothing but lie on the beach during the summer or relax by the fireplace in the winter.